I grew up with six brothers. That's how I learned to dance - waiting to get into the bathroom. 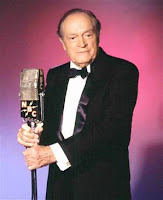 Thumd up to Mrs P. And Bob Hope. What a great saying from Bob Hope. You don't see too many one comics like that any more!!! I've just started reading Hunger Games on your recommendation and I'm totally hooked already. Thanks for the great tip!